March 31 is the momentous day for us, my wife and I. This is a double celebration for we both graduated from our elementary education course in a separate year but the same date. My wife and I were studying in humble government sponsored college in the small city of La Carlota and we completed our elementary education course in the same date, March 31 but in different year. I was ahead of my wife for 6 years. I finished that course by myself unlike my previous commerce course which I never spent a penny for I enjoyed my academic scholarship as editor in chief of the college public, The College Voice. I was right away hired by the local Rural Bank where I had my on the job training as an apprentice. Anyway I pursued my elementary education course by my own money. I went to the college during my off office hours and Saturday. It was in the year 1985 that I completed the academic requirements to the degree of Bachelor in Elementary Education (BEED) with flying colors. Gil and Rebing are very happy indeed. 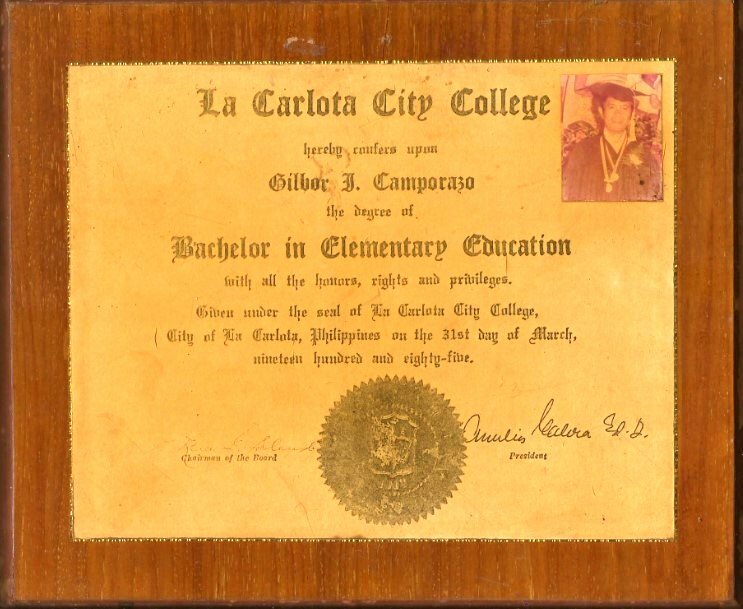 I take much pride and happiness for my wife's degree earned for I defrayed her entire college studies fees until she completed it. 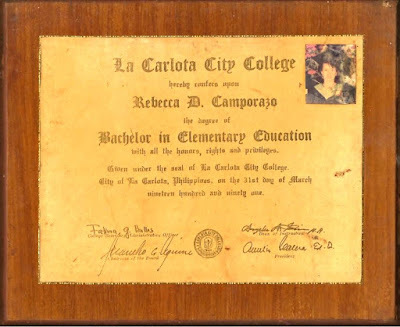 She took also the elementary education in the same college where I studied. 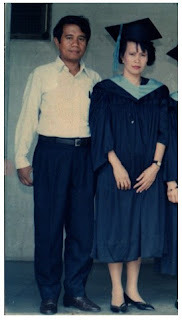 It was on March 31, 1991 that she climbed up the stage to receive her diploma from our former City Mayor Juancho Aguirre. 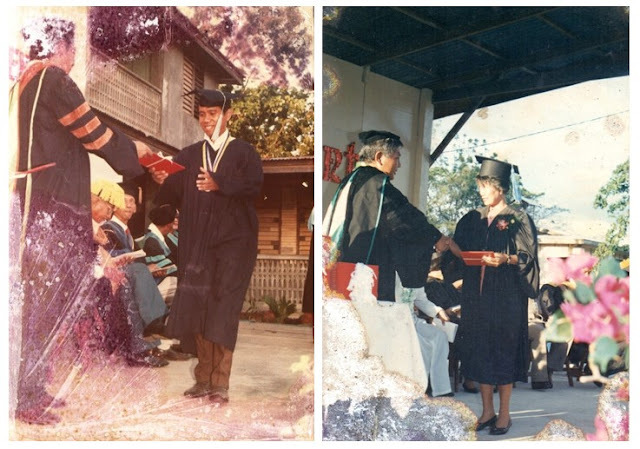 I was sitting in the seat assigned for the parents, guardians, spouses of the graduates. I couldn't express my happiness when I saw my wife marching, going up the stage, receiving her diploma. It's beyond measure so to speak for a person who spent much for the education of his spouse just like me. I couldn't wait for her to go down from the stage to congratulate here. I saw from her face on how happy she was while receiving from the Mayor of her diploma. "Congratulations, Bing!" I greeted my wife as I accosted her going down the stage. I hugged her with my tears of joy gently falling from my cheeks. "Thank you, Bor," she replied unconditionally. It's again a synchronous date, March 31 and we have also a synchronous birth date, October 13, 1951. Indeed, are we meant for each other? All these things we offer to our late parents and to our 6 children. And most of all, we're all very grateful for God's guidance and inspiration that in Him nothing is impossible. We know He's always there in good times and in bad times. Wow, who would have thought that there's a big achievement happened at same date for the both you.I think you both really meant to be. Congratulations by the way for all your achievements in life and for your wife as well. I like the idea of sending your wife to college, it is so rare to hear something like that. Thank you so much for sharing this with us Sir. It's a wonderful feeling to have read this kind of comment. I am well pleased to share this to everyone including you. Thanks too. I really admire your memories when it comes to events like this. 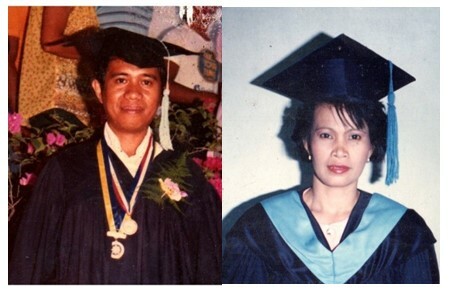 You are really destined for each other with the same birthday and even graduation day. Thank you, Franc. You still remember our love life. 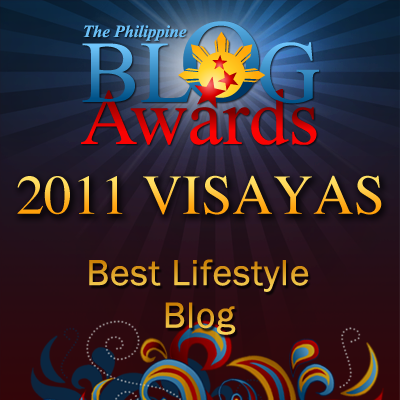 Its nice to read people's success stories and achievements. It inspires people. I hope many readers, specially the younger age, can read your story. I am hoping so. In doing so, they would be indeed inspired. This is so beautiful and so well timed too! Just 2 days back my mom and I were going through her school and college certificates! It brought her back such beautiful memories of her youth!!! Memories bring us back to our youthful days which are so wonderful and amazing so to speak for the beautiful life we had had experienced. Such nostalgia!!! I remembered my parents B&W photos. Loved the feelings in this post. I've seen many couples split apart due to the differences in education. But I'm so touched that you guys last through and even make the effort to remember this date. Everything we have had as a married couple is preciously treated by us as memorable for it writes our life story for our posterity to learn, to study, to appreciate and to value as their forebears. What a beautiful story to share about your mutual achievement and celebrations. Congratulations!